This is one of Gainsborough's finest full-length portraits in the tradition of Van Dyck. The costume and accessories deliberately echo seventeenth century fashion and enhance the elegant beauty of the Honourable Mrs Graham (1757-1792). She was born the Honourable Mary Cathcart, daughter of 9th Baron Cathcart, who was Ambassador to Catherine the Great. She married the Perthshire landowner Thomas Graham in 1774, and they bought Lynedoch House near Methven, Perthshire in 1787. The portrait was highly acclaimed when exhibited at the Royal Academy in 1777. Thomas Graham, devastated by his wife's premature death in 1792, passed the painting to her sister. It was bequeathed to the National Gallery by one of their descendants on condition that it never leaves Scotland. A sad yet romantic story lies behind this work which, thanks to a generous and visionary bequest, was among the very first works to enter the Gallery’s collection. The sitter was born Mary Cathcart, the daughter of the 9th Lord Cathcart, a soldier and diplomat who, in 1768, was appointed Ambassador to Catherine the Great in St Petersburg. His second daughter Mary became a prominent figure in the fashionable society of Georgian London. By all accounts she was a young woman of keen intelligence and great charm. She attracted admirers as diverse as Robert Burns and Georgiana, Duchess of Devonshire who recalled ‘her goodness, her sense, her sweetness’. But it was Mary’s beautiful looks that captured the imagination of her peers. When Gainsborough exhibited this portrait at the Royal Academy in 1777 it attracted much attention and secured his sitter’s reputation as an icon of contemporary beauty. Mary Graham was painted by Gainsborough when she was eighteen years old, a few months after her marriage to a young Scottish laird, Thomas Graham, later Lord Lynedoch. The couple might have expected to settle permanently on Graham’s Perthshire estates but, afflicted by tuberculosis, Mary’s health was soon in decline. They sought warmer climates in Portugal and France to ease her illness but she died, aged just thirty-five, in 1792. Her widowed husband then launched himself into a military career, becoming a celebrated commander under Wellington in the Peninsular War. (A portrait of Thomas Graham in his military uniform by Sir Thomas Lawrence hangs in Apsley House in London.) He never remarried and, according to tradition, he could not bear to contemplate the Gainsborough portrait of his young wife which was kept out of sight in storage. He survived his wife by some fifty years, and after his death in 1843 his estate was inherited by a second cousin, Robert Graham of Redgorton. The Gainsborough portrait was retrieved from a repository in London and bequeathed to the new National Gallery in Scotland with the binding condition ‘that it shall never leave Edinburgh’. The portrait of Mrs Graham has long been recognised as one of Gainsborough’s greatest works. Unlike his rival Sir Joshua Reynolds, Gainsborough did not travel to Italy and he did not feel the need to emulate the weight and resonance of classical and Renaissance art, finding instead sufficient inspiration in the flamboyant portraits of the Flemish painter Van Dyck. 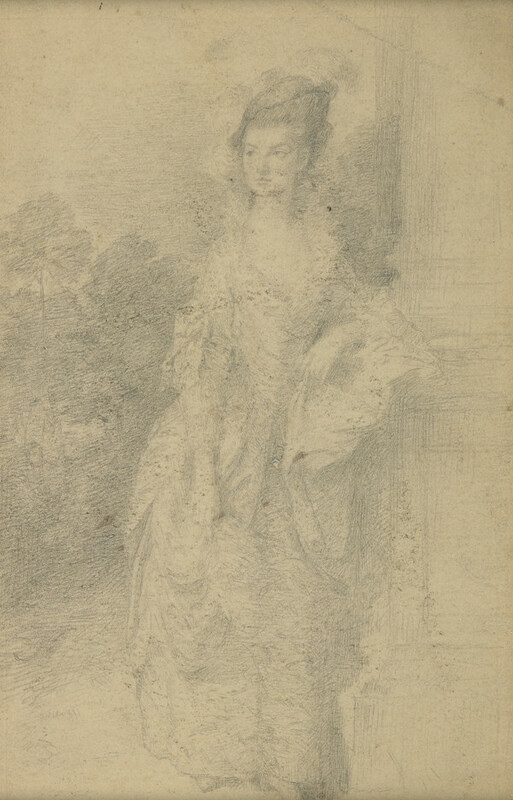 The delicacy and spontaneity of Gainsborough’s technique seems perfectly suited to evoking the fragile beauty of Mary Graham. She is presented in an imagined landscape setting, leaning against a column and wearing a shimmering Van Dyck-style dress and a magnificent feathered hat. The society beauty is distant, aloof yet somehow vulnerable and exposed. For all the trappings of eighteenth-century elegance and fashion, the poetic mood of this portrait has a timeless appeal. It has now become one of the images most closely associated with the Scottish National Gallery.